I have always been an Agatha Christie fan....her books are easy 'whodunnit' reads, have good plots, need a fair amount of brain tapping, and generally have one of the two sleuths who always solve the mystery - Hercule Poirot and Miss Marple. But the dilemma that I have always faced was which one of the sleuths did I like more. To tell you the truth, both Poirot and Miss Marple as individuals are not very likeable. Poirot was a self-proclaimed genius who did not have an ounce of humility in him.....at times he was quite suffocatingly smug (Why are brilliant detectives such egoists, I wonder, Holmes was another example). Even when you know that his smugness is justified after a brilliant bit of sleuthing, you might find his manner pretty irritating! When it comes to Miss Marple, one can guess why Agatha Christie created her.......Miss Marple's cases are what we call: "Tea-cozy books". They are lighter reads, intriguing enough to spend a nice sunny evening in the garden with a cup or two of tea!! And best of all Miss Marple in appearance was nobody's idea of a detective.......in her own words, she looked like a "dotty old maid"! And so, creating a sleuth like that, Christie could get away with putting her upto tasks in the plot which nobody would suspect her of. She was often underestimated by people which served her purpose very well. However, personally, I did find her to be a dotty old maid!! 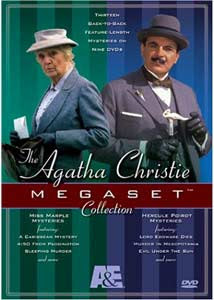 What would have been very intriguing and amusing too, was that if Christie could have put both Poirot and Marple together in a book working on the same case..........my belief is that Christie knew that would have been a catastrophe. Both would have been at logger-heads and might have come to some mud-slinging about the other's way of sleuthing (given both their 'I will solve it my way' manner). But, that would have been fun for the readers. Christie did say, "Poirot, the complete egoist, would not like being taught his business or having suggestions made to him by an elderly spinster lady." But then again, it might be so that Agatha Christie did not put them together because her prejudice in favor of Hercule Poirot as the detective par excellence might have become a bit evident; at least till a point, after which she herself had confessed that she started finding him 'insufferable'. She has written 33 of her novels and numerous short stories with Poirot as the main protagonist as compared to 12 novels and 20 short stories with Miss Marple. Christie herself claimed to have bee fond of Miss Marple, mainly because of the association that can be made between the two - both being English, middle-aged women, living alone, with a penchant for detective books. But, in truth she wrote more books with Poirot in it; made him the more flamboyant of the two; gave him more visibility with tougher and high-profile cases to crack. One can easily discern the difference in plots between a Poirot and a Marple case......Christie always puts in more difficult clues, more twisted links and multiple number of suspects for Poirot, making him tease his brains more. With Miss Marple she is more conservative and usually gives her cases centering around a quaint English village. She favored Poirot as her discovery........but she did realize that she had created a monster that she has to live with. Poirot also proved to be more popular than Marple among her readers. He is the only fictional character to have been given an obituary in 'The New York Times' after Poirot's last book, "Curtain" was published....not even Sherlock Holmes got such a treatment !! Nevertheless, if left to me I would not call either of them my favorite person. Its not the sleuths that matter much, but the actual 'whodunnit' plots, the victims, suspects, murderers and their motives that keeps the pages turning. And when I actually think about it, many of my favorite Agatha Christies do not feature any of the two protagonists - They Came to Baghdad, Witness for the Prosecution, The Mysterious Mr. Quinn, The Man in the Brown Suit, The Endless Night - had none of the two! So, all the kudos goes to Agatha Christie for her ingenuous mystery plotting, and giving us a genre of detective fiction that had more to do with the nature and manner of the crime, rather who solved it. I start everything with a smile :) I enjoy savoring my cappuccino at Barista/Costa for long hours; n I love puzzles- Sudoku, Crosswords, Jigsaws brainteasers and the likes. Dancing (classical Kathak); Reading books with at least 300 pages; n watching movies are a few ways to loosen up.